Another Sunday, another power cut. One of the first words to learn in Accra is dumsor, off-on. From Wikipedia: “Dumsor pronounced “doom-sore” (or more appropriately dum sɔ, “off and on”) is a popular Ghanaian term used to describe persistent, irregular and unpredictable electric power outages.” Despite frequent political assurances that dumsor is over, power cuts are frequent here. Not enough gas coming from Nigeria, late rains, maintenance works — who knows? It’s an election year for Ghana, so this gets very political. Even on Twitter there is a #Dumsor tag. This was one of my favourite dumsor news from last year: the then-Power Minister being pushed on the power cuts, complaining that “Even God can’t give light all the time that is why we have nights (dum)—when the sun goes to sleep in peace. so why all the pressure?” Officially there is no dumsor in Ghana right now, but we see the power cuts here at least every other day. We manage, we have a diesel-run generator for our compound, so if the power stays off all day here (which happens) at least we still have power for cooking, and keeping water pressure on. It is noisy but worth it. In the office there are also generators, the A/C may not work then but at least computers do (so we can work, though very hot). But for many small businesses the unreliable electricity supply is devastating, and running a generator is expensive. Even in central Accra like parts of Osu there can be lights-off for 40 hours. 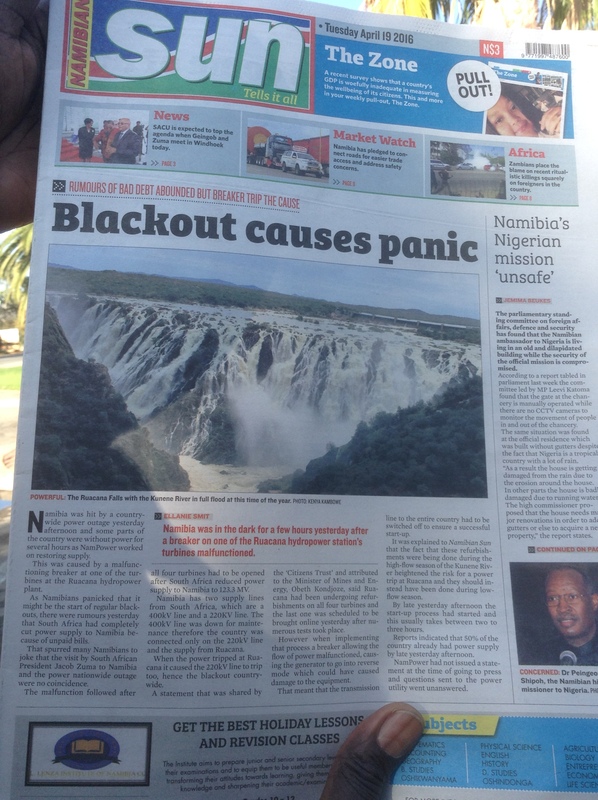 There was a power cut last week in Windhoek, and people were afraid: they are not used to power cuts like here. Better infrastructure, of course, no need for generators. Anyway, I had plans to bake and thanks to our generator, the oven still works. It was only 33C in the kitchen, not too bad, and well worth it once the muffins came out. It’s another reminder how fortunate we are, thinking of the many sweltering right now until the power is back. No wonder battery-operated fans are so available here (malaria is prevalent). Melt butter to soften it a bit if needed; here it melts as soon as it is out of the fridge. 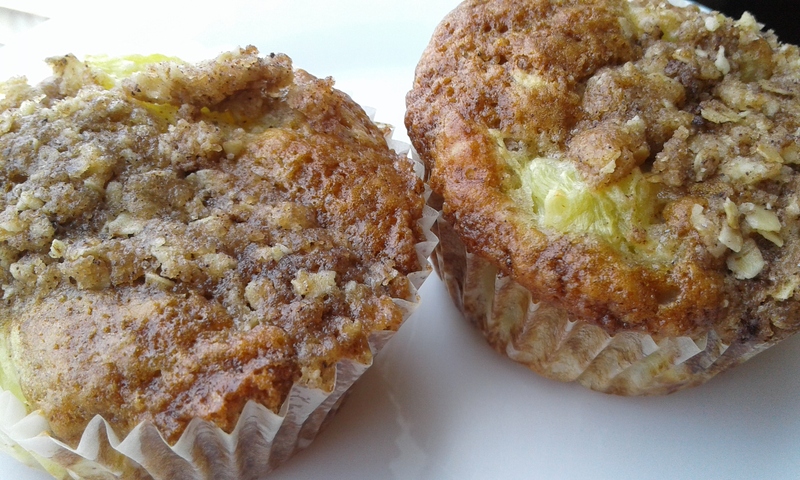 Stir streusel ingredients together, spoon a little on top of each batter-filled muffin paper. Bake for at 200C for 15 minutes or so, until muffin tops are golden. 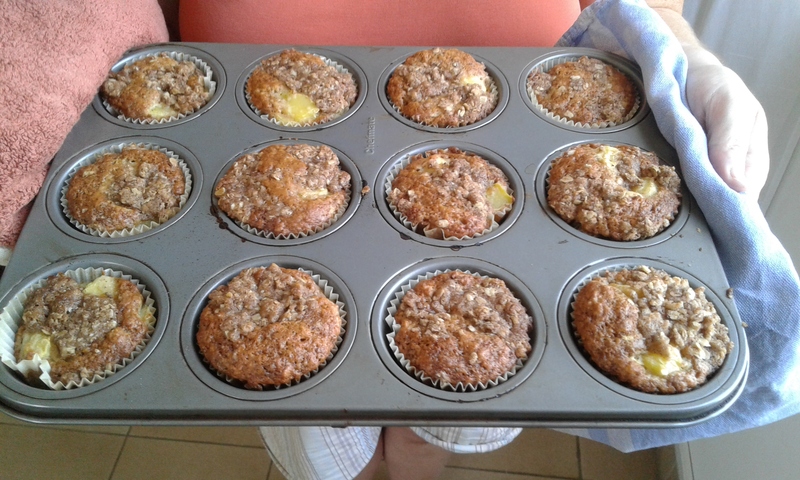 This entry was posted in baking, food, Ghana and tagged living in Accra, mango, muffins on April 25, 2016 by krumkaker. I am just back from Windhoek, Namibia. Far too short a trip, just four days for a workshop, but I would love to go back. So much space and sky! It felt a bit like Mongolia, all that dry expanse and beauty. This is just between the airport and town, but flying in the landscape looks amazing. The coast is meant to be lovely too. Windhoek itself was very tidy and modern, surprisingly hilly, with warm days and cool nights. I brought back a pile of safari lodge leaflets for closer study, its only an 11-hour trip from here, which is not too bad. It was a very busy few days, working from early breakfasts to dinner discussions. But I had a couple free hours, and rather than sightseeing I went food shopping. Much of the food in Accra is exported and expensive, and not of the best quality, so a Windhoek supermarket was a treat! Lots of biltong: beef, springbok, kudu…… Biltong is somewhat like jerky, strips of meat covered in spices and hung to dry, prepared without heat. Absolutely delicious. The kudu one is supposed to be very nice. These are just from the supermarket, but they also have fancy biltong boutiques there – to be explored next time! Look at this! 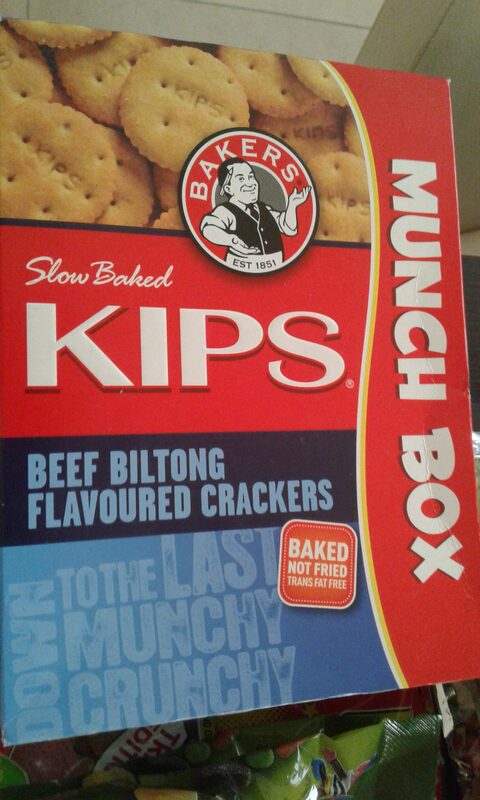 Biltong-flavoured crackers, for my carnivore husband. I also found chili beef stock cubes, camembert cheese, halloumi cheese with mint, and some lovely local stoneground wholewheat flour. Turmeric, South African BBQ spice rub, some fresh celery….. We do get celery here, but at 45 cedis a bunch in Accra (USD 11-12), it’s just too expensive. Apparently Shoprite (big South African supermarket chain) flies 7 tonnes of perishable goods to Accra weekly, including things like celery. Windhoek also had a lot of imported goods, just much cheaper than here, so this was fun. Lots and lots of coffee beans…… Ghana grows cocoa, and lots of it. Good coffee, however, is harder to find here, most of it imported. Lots of Nescafe, some very expensive arabica, a lot of robusta beans, even some arabusta (a hybrid). Beans from Togo have been OK so far, and the Upcountry Coffee Company from Ghana is pretty good, so we mix and match. We brought our Simonelli espresso maker from Rome to Accra, and a coffee grinder, so I was on a mission to restock our coffee bean shelf. And I found lots in Windhoek! 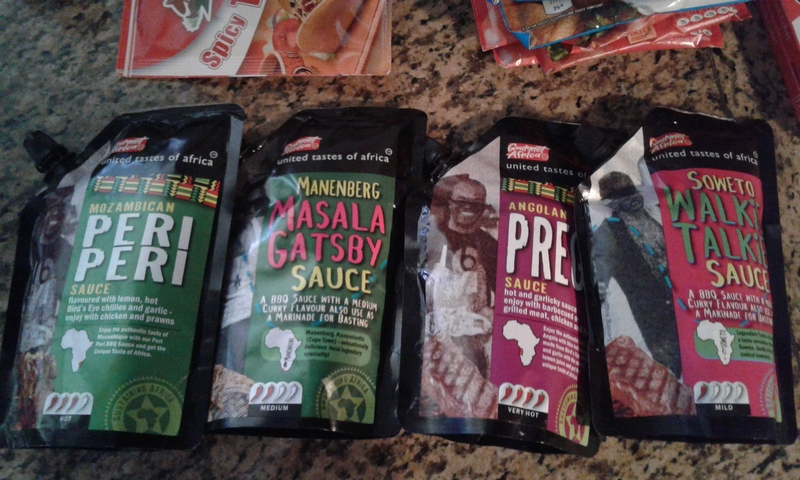 Ethiopian, Rwandan, Kenyan, Ugandan, Honduran, Colombian….. Wonderful. I stopped by Slowtown Coffee in Grove Mall, to get coffee beans roasted just a few days before – the smell was just wonderful. 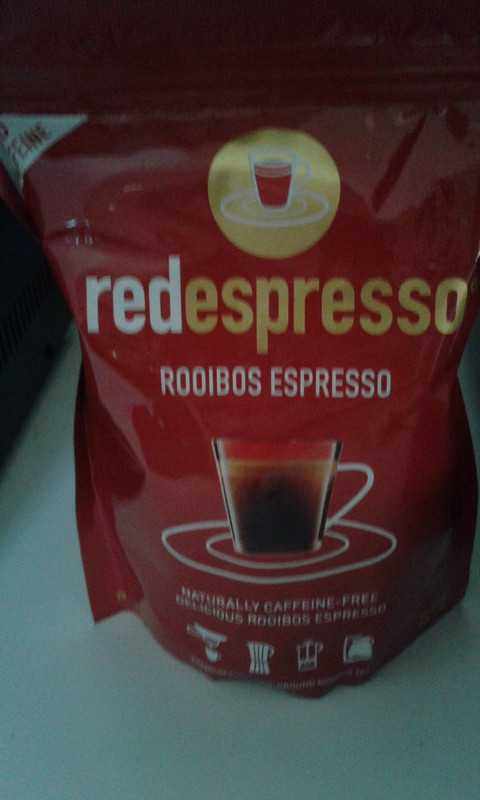 This is rooibos espresso – interesting! This was from the airport in Johannesburg, lots of rooibos variations there. Apparently this can be used in an espresso maker, so we will try it. By the way, the food was amazing in Windhoek – really good fresh dish, excellent beef, and wonderful fresh brown bread with salted butter. Finally, last food shopping, also from the airport in Johannesburg: a range of marinades and BBQ sauces, all looking rather interesting. By now my hand luggage was disastrously over 8 kilos, but being in transit it was fortunately not weighed. Speaking of weight……… I was asked if I could bring a small package back to Accra for a colleague. Sure, I said, something small would be no problem. (I know both people.) 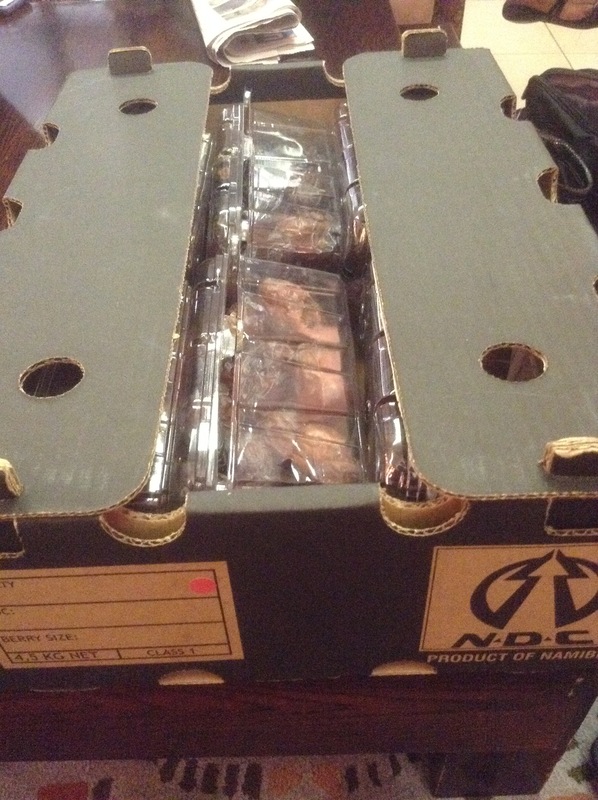 This was thus delivered to my hotel: a crate of lovely Namibian dates, 4.5 kilos of them (9.9 pounds….) which was a bit of a squeeze in my battered suitcase, already stuffed with coffee and workshop materials. They survived the trip, though somewhat sticky on arrival, and the recipient kindly gave me one of the baskets of dates. Namibia produces lovely dates, which I did not know. However, next time I will certainly ask how large the “small package” is before agreeing to bring one! This entry was posted in food, travel and tagged food shopping on April 23, 2016 by krumkaker. I thought I’d be shopping more at local markets here in Accra, but I confess, groceries are generally gotten at the supermarket. Our area (North Ridge) is pleasant but market-less, though there are always street vendors with fried plantain, pies and bread rolls. It’s a weekend hop by taxi to one of the supermarkets, since we do not have a car, and we manage. I went to Agbogbloshie Market one weekend with a colleague, near the river, where you can smell rubbish burning and going in is easier by taxi as the road is rough. It is a great market, though – we only looked for vegetables and fruit, which seemed to be sold primarily by female stallholders. An olunka (large can) of tomatoes, twenty oranges, two watermelons…. you wander from stall to stall, looking at produce and discussing price. It gets heavy, carrying all of this, but you can get someone to carry it for you (on a metal bowl on their head) which feels a bit odd but is practical, as the maze of stalls stretches out and you are still looking for good avocados. It was really nice, having a wander in a good market again. Of course I know that hygiene is an issue, but the quality was good and everything was washed well before consumption. It’s not easy to get there, but I might try Nima market soon, that is closer and smaller. Makola market here has EVERYTHING but it is huge, and a bit more intimidating. Foreigners were scarce at Agbogbloshie market – some colleagues say they think the market is dirty, so they just send their maid or shop at one of the supermarkets. I miss markets, but am a terrible haggler and supermarkets are easier, as well as more accessible by taxi. No buying imported imported red bell peppers there though – those are 79 cedi/kilo, almost 20 USD. The local green bell peppers are fine, at a fraction of the price. I still find supermarkets interesting here. They are generally South African or Lebanese, and the selection and prices can differ quite a lot, so it takes some trekking around to get what you need. Getting groceries in Accra is actually much better than expected. Most good are imported, and expensive, though here the vaguely Disney-themed Vietnamese rice was cheaper than the local brown rice. There are sometimes weevils in some items, so we have learned to keep cereal in the fridge (sometimes after freezing it to kill off remaining wildlife) and I decant everything to sealed containers. At home ants are omnipresent, and they are fast and fierce if anything is left out, so my husband is getting much better at wiping up crumbs. The ants haven’t gone for dry pasta yet, I am not sure why. It seems to be somewhat aspirational to shop in supermarkets, many people will buy only a few items (no wonder, groceries are expensive!) and well-dressed younger people will often pose for selfies in the aisles and post it on the shop site. There I am, pushing a small cart with French UHT milk, Coco Pine cordial (it’s coconut and pineapple), wondering about the ridiculous price of toilet paper and when Shoprite will have bread flour again, it’s been several weeks, and – oh dear, I wandered into someone’s photo shoot again, in the detergent aisle. Three teenage boys posing with baseball caps and cool-dude gestures, and the slightly sweaty obruni (foreigner) walking into the picture frame. I apologise, scoot past them and continue my search for a plunger while they continue their stylish selfies, next to ant spray and laundry detergent. You would not see that in London or Rome (“Whoohoo, I am at Tesco’s! Or Carrefour!”), I have not quite figured out yet why this is so popular. Today I found very small green cucumbers in the produce section! Very exciting! So I’ll be making pickles this afternoon, something I had not planned to do in 33C but we have been pickle-less for ages, so I shall try. A very good Sunday to you all! This entry was posted in food, Ghana and tagged food shopping, living in Accra, market on April 10, 2016 by krumkaker.